Today's guest is Janni Styles, award winning author of One Part Good. She's here to speak with us about her published works, her upcoming projects, and her advice to new writers. Before we begin the interview, let's have a look at the blurb for One Part Good. Janni Styles, Award Winning writer of fiction and poetry, debuts her first collection of short stories in One Part Good. All among us can relate to coming of age, adapting to old age, coping with rage or turning a whole new page. Read all in one sitting or one at a time, these stories will leave you thinking. Is aging as hard as we think? Are all teens troublesome? Is pure love possible between two wayward hearts? When there is nothing left but love, sometimes we learn love is all we need. Once known professionally for my ability to get things done, I am much different these days. I have a very quiet life which I enjoy and write as and when I can about whatever moves me. Too much of my life was spent on trying to repair things not even my responsibility to fix and I now see this as a special time of life all my own free of the emotional chains that once bound me to trying to fix things in relationships I could not fix. Relationships are special but so are we and learning to simply take good care of myself has been life changing. At age six when I flung my hand up and told the teacher, “I know what I’m going to do when I grow up! I am going to make books!” Little did I know what I was saying. Then again, I have never stopped writing. Once I learned how to write, that was it. It is akin to breathing for me. There was a very dark period in my life where I felt I had nothing to live for (I had suffered the ultimate in betrayal from many in a short span of two years after my mother died) and it turned out that writing was my lifesaver. 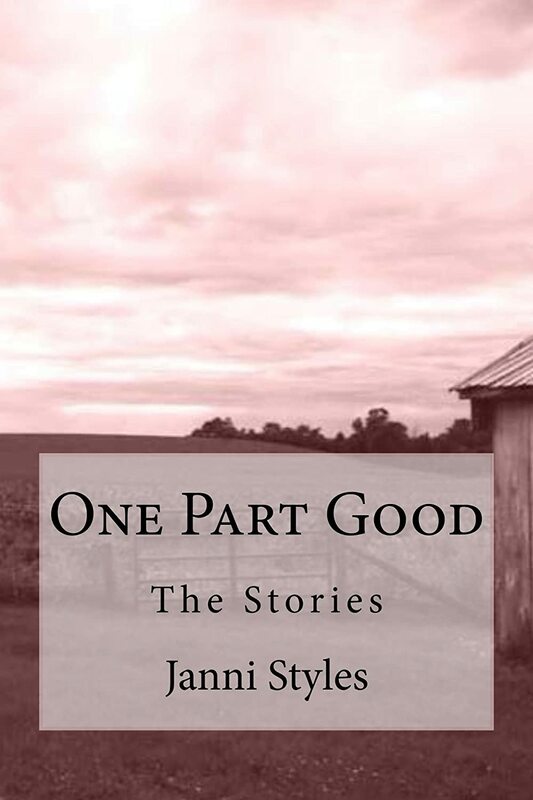 My most recent release is a collection of stories called One Part Good. These stories weave a common theme of coming of age, coping with aging or turning a whole new page. Many of these stories have appeared elsewhere but the majority were selected just for this book about family, relationships and acceptance. The idea came to me one day when I realized I had several stories just collecting dust that might be worth putting together in a collection. Magic began happening shortly thereafter and it just seemed like this was truly meant to be. All manner of unforeseen help came forth in the form of internet angels, editorial angels and self publishing web sites with templates where publishing is as easy as copy/pasting a document. At first, I thought I might try to make some money. It quickly became apparent that was not going to happen so I have since made the books free. My reward will be if people enjoy the stories or something resonates with them from one of my characters. Writing, to me, is also its own reward. If you could recommend just one of your books to my readers, which book would you choose? Probably the collection of short stories, One Part Good. I like the poetry book but it was largely written during a bleak and most painful time in my life that could not be hidden in verse. Rather, the pain was the catalyst for the work. In One Part Good – The Stories, there is more to savor, more to ponder and my writing is far more generic. Oh, dear. I have never had this question asked of me. Hmmmm. I think maybe Barbara in “Two Cents Worth” because she is just like my mother was. It’s like reading a page of home and where I came from, it reminds me who I am. There wasn’t a challenging aspect in terms of writing the book so much as polishing the stories and choosing which ones to include in the collection. I think the decision to do something with them was harder than polishing them up because that meant I had to meet a goal I had set for myself and I couldn’t let myself down on this. To write something that moves others. It really doesn’t matter how or why it moves them or what it moves within them, just that they feel something when reading or after reading that lets them know our hearts are all beating with the same hopefully rhythm. When I am strong enough, I have two books of four already written that I would like to polish and publish. One is probably going to be Young Adult, the story of a very imaginative child who bravely steps into her teen years without her safety net(s). The other is the story of four sisters who have complex dynamics of love underlying the constant strife between them, the constant patterns of anger and warring erupting due to unresolved issues feasted on for far too long. Never give up. Never ever give up. No matter who deems your writing “a nice little hobby” or “not a real job” or whatever they may say of it. They are wrong. Never focus on money or fame or a genre just because it is a popular seller, just focus on your own voice, your own unique way of writing. If you write for any reason other than the act of writing, it will show up in your writing whether you want it to or not. If writing is truly your calling, it is your calling and for me, denying my writing is like putting a plastic bag over my head, you might as well suffocate me because I will die, I am sure of this, if I cannot write. Walking home swiftly along English Bay, I passed couples strolling together, teenagers, pairs of women and men, some talking, some laughing, most holding hands like the two seniors the age of my parents. The woman carried popcorn, feeding the birds with a sprinkle here and there and I heard my mother’s voice playing in my head: clean your plate because kids on the other side of the world have nothing to eat. I felt bad about it, but it was so far removed from my realm of comprehension that her message only dulled with repetition, and I did not dwell there. A couple my own age walked arm in arm toward me. On reflex of memory, my hand clutched the air to my right, closed in on nothing, and it was all I could do to keep my feet moving. If our lives had been reversed, I wondered if Dr. Peer would realize we are all hostages of relativity, that I do not hurt any less or mourn any less because I grew up so far away from the shortcomings of her world. I tried to envision the little girl she was, imagine what her life must have been like but all I could see was the woman, oxygen fueling an unreconciled heart with blood the color of mine. Wonderful interview. Nice job girls. Janni, you are welcome back any time! I loved your answers. Thanks so much for sharing your writing on my blog. Thanks, Brenda. It was truly a pleasure having Janni here today! great interview! makes me want to write a book and read Janni's. Inspired. Here's the worst comment ever.....when I read, no I mean when I listen, the words of Janni Stylesand I just think 'holy crap' I just got hit by a baseball bat and I liked it. Thank you again for having me, loved your questions! Hi, Carrie! So glad you enjoyed this, it was fun to do, really got me thinking. Thank you, John, you are a stellar support for any writer out there in the mines. Tricia did do such a great job, didn't she, love the way she designs her pages, so professional. That is lovely, Peter, so lovely to know you have admired my ramblings. Thank you. Thank you, John. You're always welcome on Authors to Watch.